Manmohan Singh is a well-known political figure who served as Prime Minister of India from 2004 – 2014. Congress won elections in 2004 defeating Bharatiya Janata Party. Manmohan Singh took office as Prime minister when Sonia Gandhi declined the position. His main agenda during the tenure was to improve conditions of India’s economy and have peace treaties with neighboring countries Nepal, Bangladesh and Pakistan. 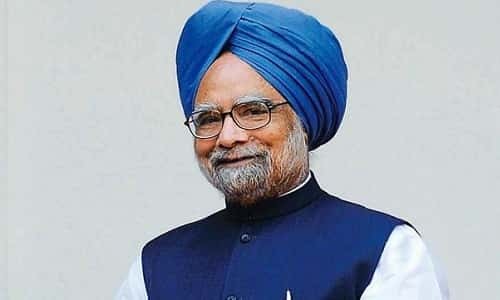 Before becoming Prime minister of India, Manmohan Singh served many other roles for the country such as Finance Minister during the reign of PV Narsimha Rao (1991). Manmohan Singh was an economist by profession and served in International Monetary Fund. In the article that follows, we try to deep dive and try to understand the personal and family life of our former Prime Minister. We also try to understand his career, political stints, as well as his achievements as the Prime Minister of one of the most sought-after developing countries of the World. Manmohan Singh was born on 26th September 1932 in Gah, Punjab (which is in Pakistan now). His family moved to India during the 1947 partition. As a Sikh, he was the first non-Hindu prime minister of India. His mother Amrit Kaur died when Manmohan was very young. He was raised by his grandmother along with his father Gurmukh Singh. He got his masters education from Punjab University in 1954 economics being his specialization. He pursued Economic Tripos at Cambridge University. After a successful stint at Cambridge University, Manmohan Singh returned to India and continued being a professor of at the Punjab University. Later on he went to get his doctorate from University of Oxford. He is married to Gursharan Kaur in 1958 and has three daughters namely Upinder, Amrit and Daman. All three of them have successful non-political careers. Her daughter Upinder Singh is also a professor and she has a number of books which she has written. Manmohan started his career in 1966 working for United Nations Conference on Trade and Development (UNCTAD). 3 years into United Nations, Manmohan then switched to be a professor at University of Delhi and he worked for Ministry of Foreign Trade with the former Cabinet Minister of Foreign Trade, Lalit Narayan Mishra. Manmohan after serving ministry of state for quite while was appointed as Reserve Bank of India (RBI) Governor. He served until 1985 and started to work as Deputy Chairman of the Planning commission of India. In 1991, PV Narsimha Rao invited him to serve as Finance Minister of India for a tenure of 5 long years. He was a member of Indian National Congress who then joined Rajya Sabha in the same year. In 2004, Sonia Gandhi unexpectedly declared Manmohan Singh as Prime Minister. He then formed a government and took the office. Manmohan Singh swore as Prime minister for his second tenure in 2009 at the Asoka Hall of Rashtrapathi Bhavan. In 2014, he announced he will not seek for third term and left the office on May 26. Not only this, before becoming a Prime Minister, Manmohan Singh has also been an advisor to many Prime Ministers of the nation. His most successful stint was as the director of the Reserve Bank of the Country when India was facing an economic crisis. The series of steps taken by him such as devaluation of rupee, privatization of various industries, reduction of taxes, amongst others really pioneered the way towards economic progress once again. Manmohan Singh devalued the rupee, lowered the taxes and privatized state run-industries when he was made Finance Minister of India, 1991. This helped the country transform and mitigate the economy crisis. In the year 2005, Manmohan had open negotiations with George W Bush for a nuclear cooperation pact in which India proposed to receive fuel technology for nuclear plants and be given the ability to purchase the nuclear fuel on the world market. The agreement was signed by Pranab Mukherjee in 2008 after many back and forth negotiations. This deal led to more allegations against him resulting in deterioration of the congress government in the later years. Manmohan Singh was a brilliant economist who improved the relationships with Brazil and South-Africa. He was successful to liberalize India and lifting controls of the ‘License Permit Quota Raj’ and help transform India’s economy to achieve 7% YoY GDP growth in 2011-2012. Under his governance, Congress ensured to pass the National Security Bill Act in 2013. This scheme enabled the poor people to receive food and grains at a subsidized low price. For example, the rice was provided for RS 3 per kg if the person is eligible for certain criteria under the scheme. This was done to diminish the malnutrition in poverty ridden areas of the country. In 2012, despite many oppositions from other parties, Manmohan Singh’s government liberalized the FDI policies to multi-brand retail companies. The policy change allowed to connect the consumers directly with the retail and save money. The other reformist decision made by Manmohan is to allow Foreign airlines to invest up to 49% in domestic carriers and develop the country’s economy. During his tenure, National Rural Employment Guarantee Act (NREGA) and the Right to Information Act was passed in 2005. His contribution to strengthen anti-terror laws with amendments to UAPA and improving relations with USA, Japan, United Kingdom, France and Germany are quite noticeable. Special Economic Zone Act 2005 – Under his administration, this act was passed to attract foreign investment through the export of goods and services. This is a great investment strategy which enhanced India’s GDP growth. Under his administration, Manmohan introduced ‘Sarva Siksha Abhiyan’ and mid-day meals scheme to improve the quality of education and enable the children from below poverty to go school and have a better lifestyle. In 2011, Manmohan Singh launched Mobile Number Portability (MNP) service which led the telecom market in India bloom and provide wide innovative options to the citizens of India. We are now equally competitive with countries like USA and China given the complexity and size of the country mass. Corruption: Manmohan Singh was involved in the Coalgate scam and unfortunately he was the coal minister at the time. Also, his government which is collective responsibility of the cabinet was highly corrupted that blamed him in the later years. The 2G scam, Common Wealth Games (CWG) and coal block allocation scams paralyzed his government and badly damaged his reputation. Being an eminent economist and politician Manmohan served India by working in different organizations has received several honors. 1987 – He received Padma Vibhushan, the second highest civilian award in Republic of India. 1993 – He was named as the Finance minister of the year by Asia money and Euromoney. 2005 – Received doctorate from University of Oxford. He was listed as ‘Top 100 influential people in the world’ in Time magazine. 2014 – He received the honor of ‘Grand cordon of the order of the Paulownia Flowers’ from Government of Japan. The Prime minister Manmohan Singh was a legacy with mixed achievements and has served Indian government for 10 long years. ● All of us are aware of the fact that Manmohan Singh was a professor of Economics in the very coveted Delhi School of Economics. However, what many people are not aware is the fact that he actually quit his job at the United Nations to acheive the same. ● Manmohan Singh is a grear writer too. We all know how he excelled in Economics and education. As such, he has written a number of books in the subject in which he is an expert. Some of his best sellers include India’s Export Trends as well as Prospect for Self-Sustained Growth. Thus, the article explains the extraordinary details of the life of former Prime Minister, Manmohan Singh.